• View topic - "Commandname: command not found"
Post subject: "Commandname: command not found"
I'm new here so I'd like to say hi first. We're Parasol Island an animation and vfx studio in DÃ¼sseldorf Germany which is why and how wo found interest in Nasa's Blue Marble data and photographs. Of interest for us is the fact that the data is in high res, freely available and that everything aligns nicely. To process the binaries from Nasa we initially found an old version of Fridgers tools which didn't work at all so I contacted him which was when he informed me about the existence of this forum, about the download link for the latest versions of his software and about his nmtools tutorial. After being able to actually run all the tools on both of our platforms (we use fast Macs and PCs) and understanding the piped workflow (we're using node based compositing software which follows the same principle ) we're now stuck with always the same problem. No matter (seemingly) which command from which tool we run the result is always a 0kb sized, correctly positioned and named output file and a "commandname: command not found" in the terminal or command prompt acompanying it. I searched this forum for this error but failed to imediatly find a comparable thread. One thread was similar but was due to older compiles which thanks to a recompile by Fridger is now fixed. In order to have a chance of localizing the reason for your 0byte output, I urgently need the precise command line and the link to your input data that you used. Despite many users of the Tools, it's the first time I hear about your kind of problem. Please study also the examples given there! Notably, the fact that for 16 bit input you must take the correct endedness settings into account. The 16 bit BMNG data are stored in 'big endian' format. Hence on 'little endian' PCs and Intel MACs you got to add the option byteswap=1 as also explained in the tutorial. I solved the issues which were all related to rights management. Running as an admin everything worked flawlessly. "nms 6378.140 86400 2.5 1 < srtm_ramp2.world.86400x43200.bin > nm86k_wK_byteswap.ppm". Thanks so much for your support and for the app Fridger! Edit: Actually I'd still like to achive a depth (greyscale) map in combination to the normals map the command I posted above created.... researching this now. I am very happy to see your progress! RGB normalmaps or also surface textures have: 3 * 8 bit = 24 bit, i.e. 8bit per color. RGBA images have 4 * 8bit = 32 bit. 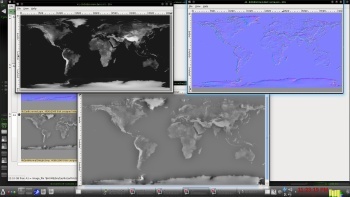 Its a pitty that non of Fridgers tools can "free" the hight map data into a greyscale image out of that Nasa Bin. that *.bin file IS a raw 16 bit singed integer HEIGHT map DEM , it is only in a RAW format . Photoshop should be able to use it ???? Last edited by John Van Vliet on Mon, 12-11-12, 7:44 GMT, edited 7 times in total. and will get you VERY CRAPPY bad image . that IS A DEM ! now you want to change the normal map BACK INTO A HEIGHT MAP DEM ???? use the original DEM !!! ?? why ??? i do not know ??? here is an example that "srtm_ramp2.world.86400x43200.bin "
Last edited by John Van Vliet on Mon, 12-11-12, 9:52 GMT, edited 1 time in total. Im gona check out some of your links which I appreciate you posting. the 7 gig image "srtm_ramp2.world.86400x43200.bin"
Last edited by John Van Vliet on Mon, 12-11-12, 9:58 GMT, edited 3 times in total. Photoshop cant accuratly use the RAW format though. Nasa even admits that on the blue marble site for the bin: "Although it is possible to import the file into Photshop CS and later, Photoshop will not read the signed data correctly: elevation values above sea level start at 0, while negative elevations "wrap" to values near white (65535), which is sea-level." This was the first thing I tried but the result is indeed very messy. as I emphasized already in our early PM conversations, grayscale DEMs represent the INPUT data for my tools. It seems to me that your task is rather a mere format conversion of the published 16bit DEM data file (BMNG) into a grayscale TIFF or PNG, for example. My NM tools could be helpful to handle e.g. size reductions at the full 16bit DEM level. The purpose of my NM tools is really to generate highest quality normalmaps from DEMs, which is not what you are after. I fully agree with John that you should NOT try to proceed via an intermediate normalmap. The latter involves numerical gradients and hence is a sort of "sensitive" object numerically.